For a group of us not running the 26.2 miles through the streets of our capital city, Sunday 23rd April was a big day too as we eagerly awaited just the other side of finish line to greet all the runners in various roles. We too have an early start – my alarm went off at 5:45am to get to Farnborough to meet the coach up to London with the rest of the marshalling team. All of us this year looked like we had been tangoed or were off to some really bad traffic cone themed party – bright orange baseball caps, bright orange showerproof jackets (with a hood though – bonus incase it rained!) and of course, the bright white trousers which are standard practice – I now have 3 pairs I will never wear outside the house again! There was lots of excited chatter on the coach, mainly about who from the club was running, how we all thought they would be feeling and the excitement over our roles for the day. When we arrived in London, we headed straight for the finish area. It was wonderful to see The Mall so quiet – in a few hours it would be flooded with runners, press and spectators. Buckingham Palace stood proudly in front of us. There was lots of joking about how when we run the marathon, The Mall section is a blur! So Sharon and I took the opportunity to do a ‘sprint finish’ down The Mall so that we could remember what it was like to run on it. A bit of silliness before the day got busy! The Medal Hanger team and Medal re-supply team were then set to work unpacking just under 40,000 medals into bundles ready for the mass race. It sounded like there was a lot of sleigh bells being rung as the medals clanged together. Shortly after, some of us were put into position to medal hang for the ‘Mini Marathon’ – this is where children from running clubs across London and the country all compete. There are three age groups for both boys and girls. It’s wonderful to see that so many kids like to run and compete. I was asked to help medal hang for these races and I happily obliged. However, after joking to some of the other medal hangers how I had escaped vomit in the previous two years that I had medal hung, my lucky streak was broken as a young lady of about 14/15 years old decided to be sick just before she reached me. Luckily she missed the precious white trousers, phew! At 10:30am, we were then allowed to have lunch. This may seem early to some, but this would be our last opportunity to eat and rest before the onslaught of runners headed towards us for their much coveted medal. It was a chance for us Sandhurst Joggers to have our usual banter and chats with each other. We did have a little lull first where we could watch the Wheelchair competitors come in and we could then eagerly await for the male and female elite winners to cross the finish line. This too is an honour to see so close (as long as we could see past the bank of TV cameras and photographers all lined up to capture the shot of the winners! Oh and there was also time to ‘celebrity stalk’ and get a photo with Nick Knowles! Gradually, some of the 20 lanes were then opened as the ‘mass’ runners started to appear – we were all primed and ready to go with medals hanging from our arms. There were big cheers for the first runner over the line, who did look very proud. The Sandhurst Jogger team were all spread across most of the lanes this year, unlike previous years. But that hopefully meant we ‘caught’ all our runners between us! Then the stream of runners gradually started to increase. There were a few sweaty hugs and then the shouts and cheers started to go up as the first few Sandhurst Joggers came through – Helen Antram, Lisa Hale, Kathryn Shaw to name a few that I saw…….plus I got to see one of my best friends who did it in 3hours 23mins, smashing his PB!! We were then away. Medals being placed over necks with ‘Congratulations’ or ‘Well Done’ followed by ‘It’s all over now’! I was hugged a lot and even received a fair few kisses from male runners who, in their words, were so pleased to see me! The charity runners then started to come through and the emotions started to increase. When someone is crying as you put a medal round their necks, it’s hard not to well up yourself. To see how much effort they had put in and how much getting to the end and getting that medal meant to them is awe-inspiring and heart-warming. I got told by two people that they loved me, I was also told that I was a sight for sore eyes! Some excitement then rippled through the lanes as we realised Prince William, Kate and Prince Harry had taken over some of the medal hanging – a bit too far from where I was, but I still got a glimpse of Harry! As the time goes on, the tears and the cries of ‘I can’t believe I did that’ from the runners increase dramatically. I found myself crying along with them as I hugged them at the end whilst they sobbed through exhaustion, pride and disbelief. You then had the people in fancy dress and large costumes too and not to mention the chap with a washing machine on his back – a marathon is hard enough without that added weight! Time flies when you are medal hanging. They say that on average we hung a medal every 4 seconds, so you can imagine how quickly the day goes. The stream is constant. You quickly go through the medals on your arms, so thank goodness for the medal re-supply team who were there, primed and ready with the next set for you, to keep the flow moving effortlessly! 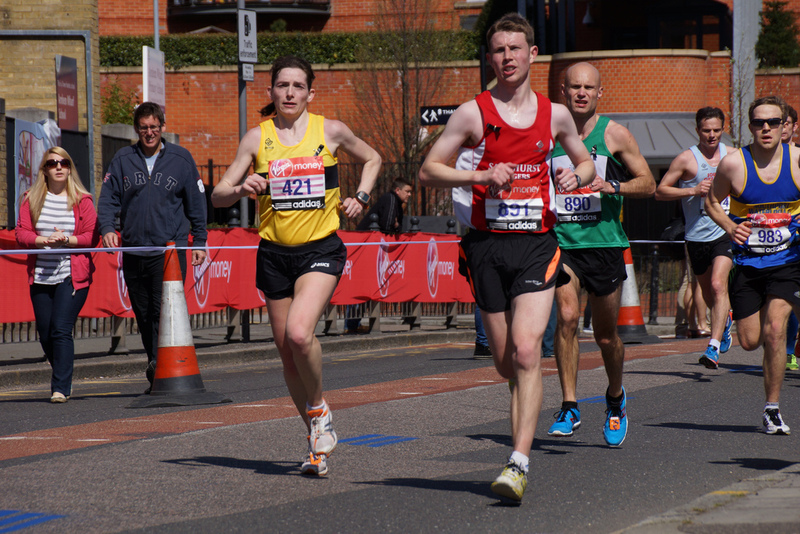 As the flow of runners starts to slow down slightly, some medal lanes are closed down and the runners filtered through to the remaining ones open. It’s only as things slow down, you realise how achy your arms and back are (absolutely nothing compared to how the runners felt though!) and also how you haven’t been to the toilet for about 4 hours! But you really don’t care. It was soon 5:15pm and we had to get back for the coach that was leaving at 5:45pm. Runners were still coming through, so some Medal hangers and the other Finish Team members stayed late to ensure everyone got the welcome that they deserved. On the way back on the coach, there was lots of talk about who we had seen come through, how well they had all done and regular checks of Facebook for posts from our team mates! Everyone talked about how it was an honour to be part of the day and how fantastic it all was. To anyone who hasn’t done it before, I fully encourage you to put your name down to help in the Finish Team – whether it is hustling, Medal Hanging or some of the other wonderful roles. It is the most rewarding experience to know that you are making people’s days, and a wonderful event to be a part of and to be in thick of it. The laughs you have are fantastic too! For me, the role of being a Medal Hanger is a true honour. I have been lucky enough do it 3 times now, and it never wears thin and is always a privilege. An emotional day but one that stays with you forever.